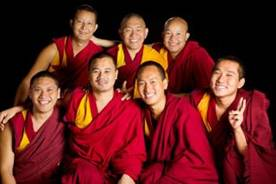 The Tsawa Monks are a group from Gaden Jangtse Monastery in South India Touring the USA to raise awareness about Tibetan Buddhism and culture. We seek to promote harmony and peace amongst all people and within each person, and to encourage the cultivation of compassion and kindness towards all living beings through the sharing with others of our ancient and vibrant Tibetan Buddhist traditions. Click here for schedule of ceremonies and activites. The Monks will be at Unitarian Universalist Society: East from April 27th – May 3rd, these services are by appointment, contact the church office at 860-646-5151 or email for more information here. Appointments cannot be made until after April 27th, thank you. Visit the monk’s website at www.tsawamonksusa.com.